1: The overall length of the chime, usually expressed in inches, measured from the top of the ring hook to the bottom of the sail. Most (all) Wind Chimes made in the US today are sized in this manner. 2: Ring Hook or knotted loop. All better chimes use a metal ring or strong knotted loop. This isolates the chimes suspension cord from the hanger. 3: Suspension Cord. Multi-ply, man made synthetic cord for use outdoors. 5: Tubes and finish. Can be steel, aluminum, glass, bamboo, or wood. Hard metals, such as steel or aluminum, produce a sharp tone. Soft metals, such as copper, make a more mellow sound, Bamboo and wood produce a hollow sound. 6: Striker/Clapper. Strikes the tubes to produce the sound. 7: Sail. Catches with wind to move the clapper to strike the tubes. The number of tubes that a wind chime has determines the number of notes that it can play. Wind chimes with many tubes have the ability to combine more sounds and create different harmonies. Wind chimes with fewer tubes ensure a smaller range of well-tuned sound. The tube finish on wind chimes primarily affects overall visual appeal. Since wind chimes are usually on display for all to see, this can be just as important as getting the right wind chime sound. 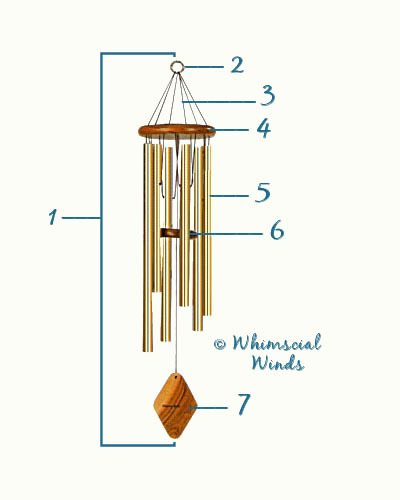 Overall wind chime length determines the tone and depth of the sound. Longer wind chimes produce lower, fuller tones, while shorter wind chimes produce higher pitched tones. The wind chime's clapper is the piece that comes into contact with the tubes. The point of contact is carefully calculated to provide the best possible sound. The size of the wind chime sail determines how much wind is needed to cause the wind chime to sound. Most of our wind chimes are designed to begin chiming in eight to ten mph breezes. This is a desirable size because a less substantial sail would compromise durability, while a larger, heavier sail would result in less sound. The primary material choices for wind chimes are Metal, Bamboo, Ceramic and Glass. This brief wind chime material overview will help you decide on a wind chime that's right for you. Metal Metal wind chimes are the most popular because of their durability and high tuning accuracy. Only metal wind chimes can be tuned to specific tones and notes. Metal wind chimes come in a variety of melodies, and can even be tuned to well-known songs and themes. Metal wind chimes are also waterproof and rust resistant. You don't have to worry about them chipping or losing their beauty, so they'll last year after year. Bamboo Bamboo wind chimes are not as durable as metal wind chimes, but they are designed to provide beautiful, soothing sounds. The tones of bamboo wind chimes are hollow, deep and resonant. Although they cannot be tuned, these wind chimes can emulate relaxing sounds like rain or exotic drums. Since bamboo is a plant, it is lightweight and some splitting can occur. It may happen to some degree in your wind chime, though this has but a minimal effect on sound quality. Choose bamboo wind chimes for a natural and environmentally friendly way to relieve stress, with tones that will soothe the soul. Ceramic and Glass Ceramic and glass wind chimes are typically chosen for their decorative style and color rather than for their sound. These wind chimes are often available in such whimsical themes because it is relatively easy to design complex shapes and patterns from glass and ceramic materials. If you are looking for a unique gift, these are the perfect wind chimes. They add a lovely dimension to any environment, and are an inexpensive way to accent both outdoor and indoor areas. Many wind chimes in this category are made specifically for decorative use inside the home. Tubular: Tubular wind chimes are the most popular wind chime design. These wind chimes are available in a vast array of styles and sizes to suit any location. Tubular wind chimes are made of several vertically hanging tubes, with each tube lending its own tone. A tubular wind chime with tubes of varying length sounds great and offers exceptional visual appeal. Tubular wind chimes are typically aluminum or pewter. Bell: Bell wind chimes are made out of one or more bells. These wind chimes are available in traditional styles or in unique contemporary styles with modern, geometrically designed bells. Most of our bell wind chimes are made of brass. Door Chimes: Door chimes aren't exactly wind chimes, but they are still a great way to welcome guests when they come to your home. These chimes can be hung on the door itself or on the outer frame. Their sound tells your guests that they are entering a friendly and cheerful place. Door chimes also act as a simple and inexpensive security measure. A door chime will alert you when someone enters your home or business. Our door chimes are made of copper, aluminum or bamboo. Chimes that can be engraved have an option available on the product's listing page. All of our engraving is done on the chime's windsail. Most of our sails are round, oval or rectangular. Examples are shown throughout our site. We will contact you before we engrave if we find an obvious mistake. Please check your sales receipt and contact us if you wish to alter names, dates, or any other text as soon as possible. We can not un-engrave. Space on any individual sails is limited by the size of the wind chime. We can engrave as few as 20 or as many as 300 characters. Character and size limits for any particular chime is shown on the chimes product page. We use both laser and contact engraving. We do all our engraving in house with engravers made in the USA. Our engraving will not affect the warranty or musical performance of the wind chime. All of the manufacturers whose chimes we engrave, know we are engraving their products and have given their permission to do so. We will engrave almost anything that can be fitted nicely onto a wind chime wind sail. Although we will not engrave copyrighted images, images or text that directly disparages or belittles - people by name, political affiliations, or religions. Most Quality wind chimes, are tuned to begin "chiming" at 6 to 10 mph wind speed. Hang your chime directly from the O ring or loop at the top of the chime. Don't extend the top string of the chime by adding chain or string. This may cause the entire chime to swing, when in fact only the center string and clapper should move. Hang your chime where the wind can reach it from as many directions as possible. An open corner is ideal when hanging the chime from a building. Experiment with hanging your chime at different heights. Wind velocity tends to increase with higher elevation. Try hanging your chime in different locations during different times of the year. The prevailing winds change seasonally. If you own multiple Wind Chimes, you can create an environment of sound all your own. Experiment with the ones you have, You can hang chimes to alert you to changes in wind direction, and incoming weather! Aluminum Tubes: Wind Chime tubes made of aluminum will not rust when exposed to the elements. However, over time, the aluminum may show pitting as a result of environmental factors. Please note this will not affect the beautiful tones of your chimes. If necessary, use mild soap and water (or a foaming, non-abrasive cleanser) to clean the tubes. Wood Parts: Periodically, apply a thin layer of exterior use Danish or lemon oil with a clean cloth to the wood parts. Regular oiling will help protect the wood and retard the natural aging process..
Bamboo Chimes: All our bamboo windchimes are made using natural and sustainable products such as bamboo and coconut shell. Each is hand-carved and hand-tuned by artisans in Bali or Vietnam. With proper care, your bamboo chime will typically last from 3-4 years when hung outside.